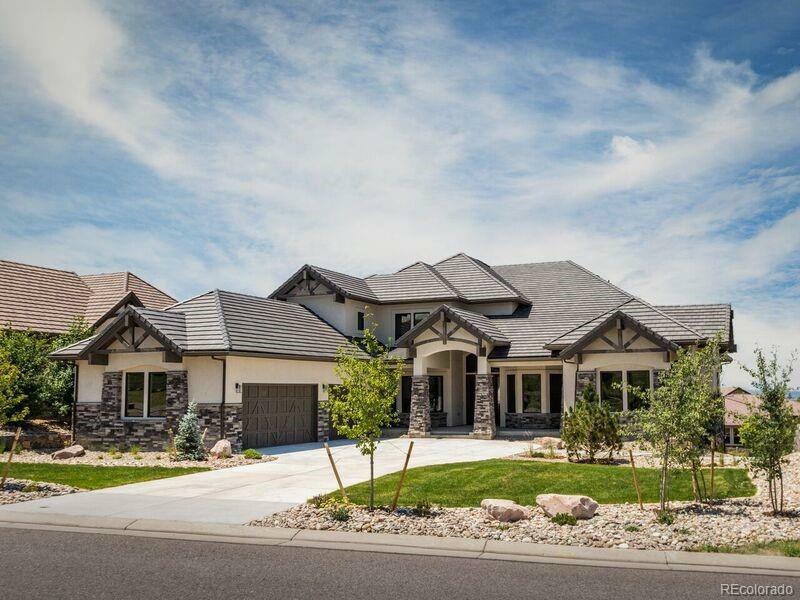 Exquisite custom home boasting views of downtown and the mountains. An inviting interior is well-appointed with oak hand-scraped hardwood floors throughout and two floor to ceiling stone fireplaces. The stunning entrance flows into a beautiful foyer and great room, which is open to the gourmet kitchen. Step right out to the upper level covered patio for entertaining and to watch amazing mountain sunsets. The main floor master has a huge sitting area, fireplace and a private covered deck. The elegant master bathroom has dual sinks, and an oversized shower with heated floors. The kitchen is a cookâs dream with Ann Sacks backsplash tile, slab granite, a wine chiller and a huge center island. The butlerâs pantry is right off the kitchen, leading to the detailed and sophisticated dining room. Custom cabinetry and built-ins throughout the home. The second floor loft features two walls of view windows and a second master bedroom, both lead to a covered patio that overlooks the Denver skyline.